Is MSNBC the place for opinion? Griffin was responding to a significant decline in MSNBC’s ratings, which the Times reported was down 18% in prime time in the second quarter of 2013 compared with the same period in 2012. In May 2013, MSNBC—which often has the second highest cable news ratings behind the Fox News Channel—fell to fourth place, trailing even HLN, which was once known as CNN Headline News. One theory for its current ratings woes is that the recent spate of big breaking news events— such as the Boston Marathon bombing, the Oklahoma tornados and the Jodi Arias trial—does not play to the strengths of a channel better known for opinion than newsgathering. The channel’s marketing slogan, “The Place for Politics,” fits with its prime-time lineup heavy on liberal-leaning commentary. A Pew Research analysis of news content on the three major cable channels conducted late last year found that the highly competitive world of cable news is a mix of reporting and opinion, with a good deal of the latter, particularly in prime time. But the analysis of 108 hours of cable programming over three days in November and December 2012 showed that MSNBC was an outlier compared with its rivals. In the Pew Research sample, two of the three major cable news channels had a fairly even distribution of airtime devoted to opinion and to newsgathering. CNN was the only one to feature more reporting (54%) than opinion (46%) overall. 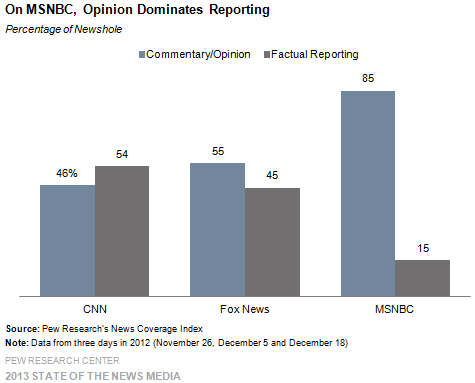 At the Fox News Channel, the split leaned toward moderately more opinion (55%) than reporting (45%). The Pew Research analysis offers a snapshot of cable content, but the reporting/opinion gap between MSNBC and its two top competitors is striking. And the numbers buttress Griffin’s acknowledgement that covering breaking news is not his channel’s sweet spot.